To an old friend who understands the missing pieces. To a young friend I write: I don't have answers but here, consider this, and this, and maybe this. Letters let us wonder and search, and sometimes declare. You like letters, too? 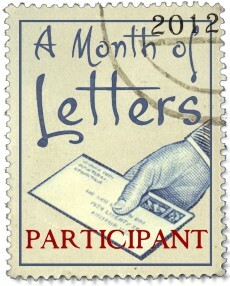 Please join me in A Month of Letters, a challenge presented by novelist (and letter writer) Mary Robinette Kowal. whose hands make errors, leave traces. can't much write now—thinking of you. somewhere I can locate on any map. in any other way but this.